Gary was born and raised in Washington County, MD where his family has lived for at least 225 years. His interests in the Civil War and passion for the 1862 Maryland Campaign go back more than 50 years to his days as a Boy Scout camping on the battlefield in the final attack area near Burnside Bridge and at Crampton’s Gap on South Mountain. There, he listened to the true stories of E. Russell Hicks, noted county historian. Gary also attended Antietam’s Centennial events as a young Boy Scout passing out programs for the last re-enactment held on the battlefield. Gary’s professional career spanned 34 years in the public works arena as a registered professional engineer with extensive experience in the restoration and preservation of historic 19th century transportation structures such as wooden covered bridges, wrought iron truss structures, & stone arch bridges. He spent the last 20 years of his career in the roll of Washington County’s first Public Works Director. In that capacity, he revamped an effective preservation program for restoring and preserving many of the county’s 19th century stone arch bridges which are very much in tact and carrying modern traffic today. Upon his retirement, he became involved as a Battlefield Ambassador while pursuing the National Park Certification for Battlefield Guide. 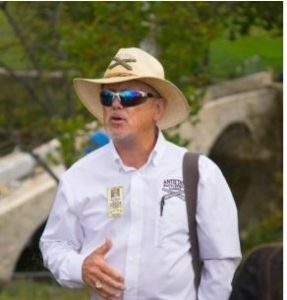 In 2013, he became one of the first four guides ever certified by the NPS as a Battlefield Guide at Harpers Ferry National Historic Park for the 1862 Maryland Campaign. He has traveled to many of our country’s Civil War battlefields in the west and the south in an effort to further enhance his tours at Antietam. Gary has led hundreds of tours with clients ranging from the very young to the very seasoned students of the battle including retired officers of flag rank, college professors and their students. Today, Gary is a member of the Washington County Historic District Commission and Save Historic Antietam Foundation (SHAF). He resides near Boonsboro, MD with his family. He is also a proud veteran of the U.S. Navy. On Wednesday, June 28h, Gary will present his Summer Lecture Series talk – Antietam Creek’s Historic Stone Arch Bridges. Gary’s presentation will give a broad overview of the many stone arch transportation structures in Washington County, primarily those along the Antietam Creek. His materials will include the history, construction techniques, failed preservation efforts, & today’s success stories of ongoing preservation with numerous photos & diagrams. The real success story lies in that Gary’s successors continue this program that leave these structures still carrying modern traffic.